Choices. Life is full of them, but what happens afterwards when we have made our choice and we cannot turn back time? The aftermath of this dilemma is beautifully portrayed in Carlo Enciso Catu’s “Waiting for Sunset”. Named Best Film and receiving several awards at the 14th Cinemalaya Film Festival, “Waiting for Sunset” presents the aftermath of romantic life-choices in a sensitive and original story. Teresa (Perla Bautista) and Celso (Menggie Cobarrubias) are an elderly couple who live together and have raised two children. Both enjoy each other’s company, but one day Teresa receives a phone call from her estranged husband Bene (Dante Rivero) who is terminally ill. Without a doubt, Teresa goes to take care of him and Celso joins her later. As the estranged pair sees each other for the first time in more than two decades, we discover why Teresa and Bene went on their own ways. The film’s pace adapts itself to the lifestyle of the elderly couple: slow and calm. A tranquillity that is filled with mundane activities that connote more than what it’s said. Intriguing and well-thought, the narrative of “Waiting for Sunset” intertwines with the lives of Teresa, Celso and Bene. Issues of the past and their separation keep us wondering throughout the entire film, as the charm of the movie lies in the story. 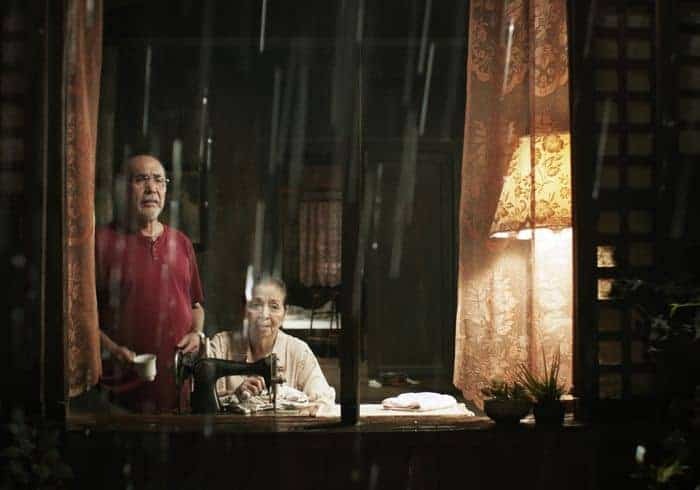 A story that addresses various sensitive topics, such as forgiveness, companionship, loneliness and death, by showing banal activities of the elderly couple. Elegant and detailed, the cinematography (Neil Daza) depicts the opposite life of Teresa and Bene. One is filled with life and light, and the other is nearing the dark end. Through numerous long and static-shots, the camera maintains us at a distance. Only in a few instances the camera gets closer to display the character’s emotions. However, this does not inhibit the fantastic performances of the renowned Filipino actors and the powerful story that reaffirms the actors’ incredible chemistry with each other. Senior’s perspective on the world is a rare topic for film productions, but in this aging-day-society, it is gaining recognition and makes “Waiting for Sunset” a relevant work. Revealing in a profound and easy-going manner, the story progresses in a natural and almost familiar way, nothing bizarre nor extraordinary. Just the lives of elderly people and how they live with the choices they made when they were young.